The picture above is a detail of a detail. 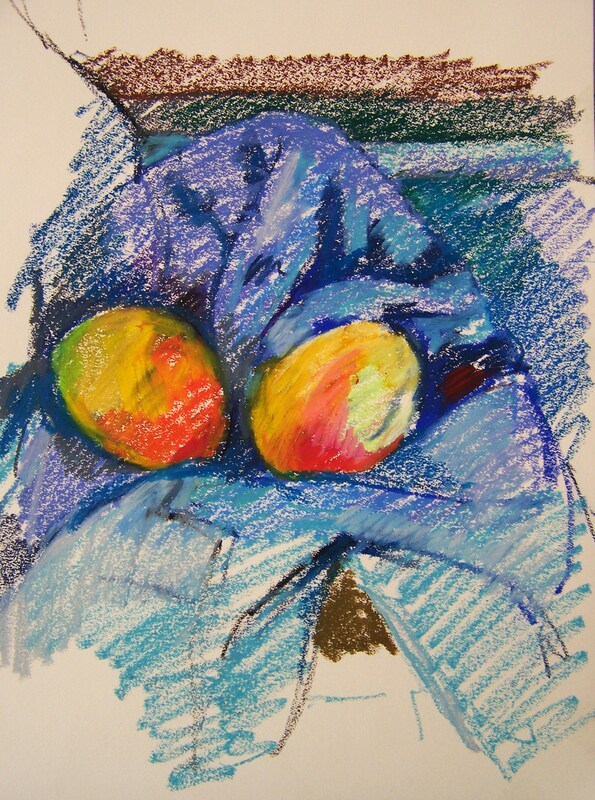 I copied a portion of Paul Cezanne’s Chateau Noir at the National Gallery of Art. (I posted that one recently.) 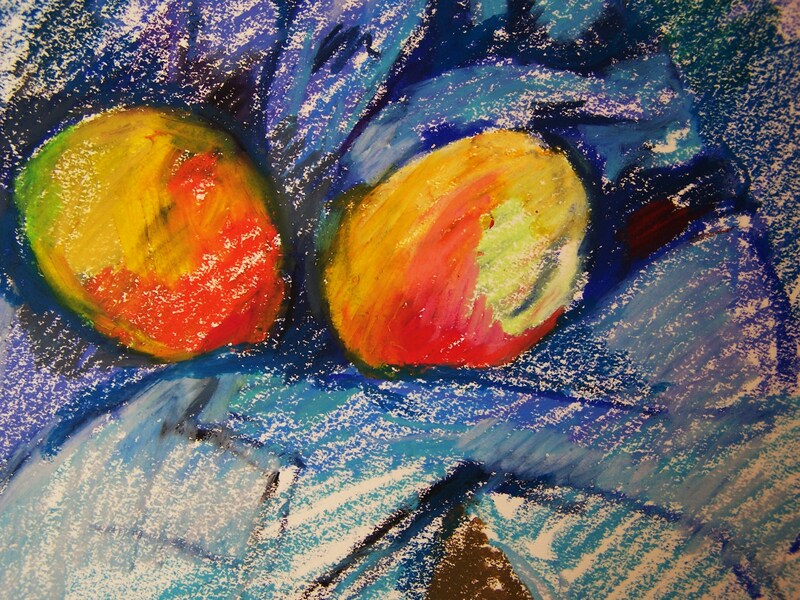 This picture is a detail of that drawing (which portrays a detail of Cezanne’s painting). Already this post is turning into Russian nesting dolls. Anyway. I like looking at details of pictures (including — I don’t mind telling you — my own pictures). 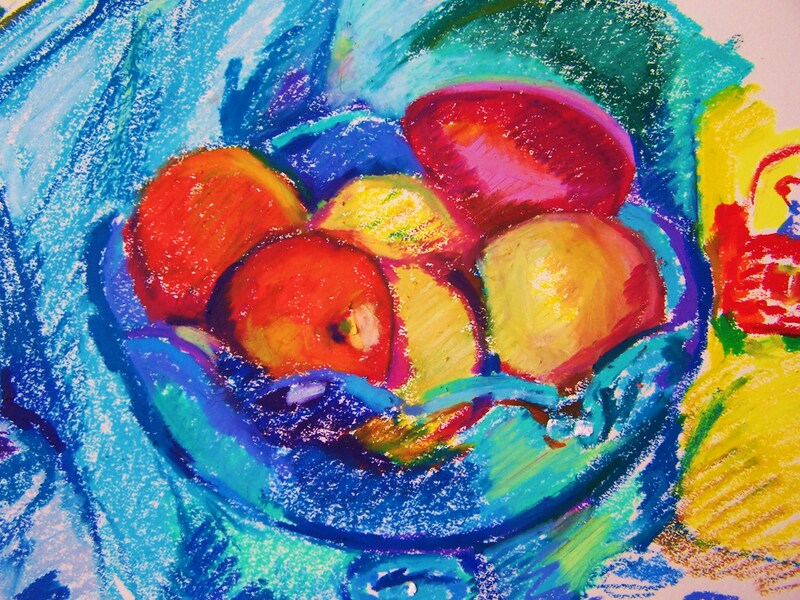 And for those who want to do abstract painting, you could find motifs for the abstractions by enlarging a small bit of some representational image. What I like about the parts, though, is the way they reiterate whatever good things are happening in the whole. At least in a really well organized picture the parts will be doing on a smaller scale whatever the composition is doing on the large scale. It seems to me that this is true in the works of all the great masters. So the lesson is — actually I’m not sure what the lesson is. Just be a great artist. There you go. Easy peasy. 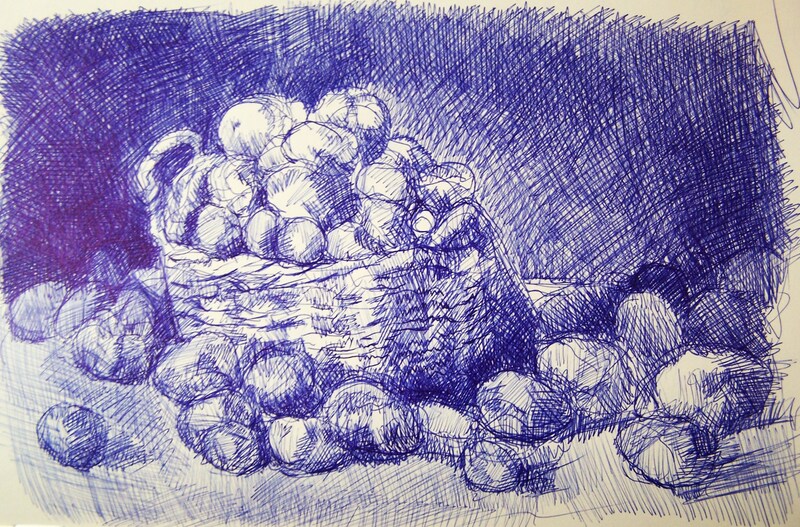 Last night I was drawing my small deep blue copy of the dark and moody Van Gogh still life of potatoes (above). And that is a great night meditation, let me tell you, those deep shadows and the humble potatoes, the basket-like-a-bird’s-nest. And then this morning the sun rises and I have new yellow still life objects just discovered at the second-hand store! Ever since silly Andy Warhol, some artists (not this one) have assiduously sought their fifteen minutes of fame. 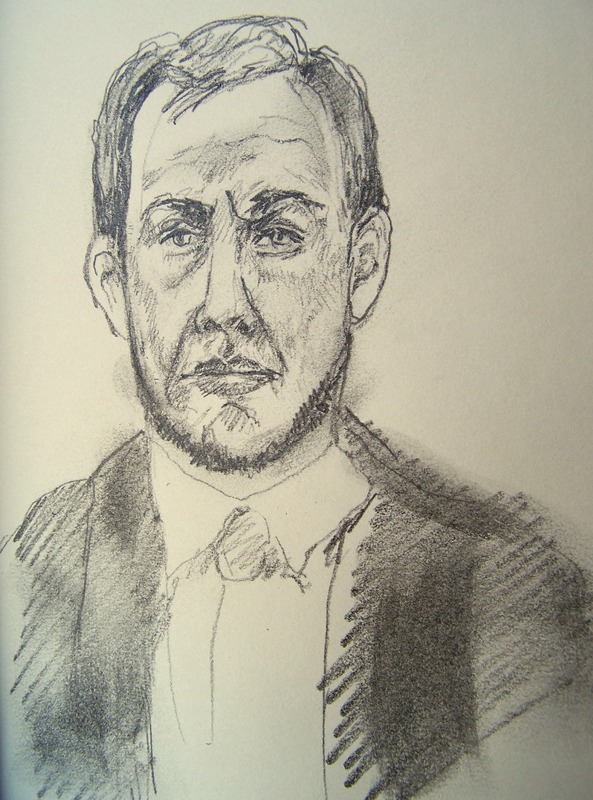 Instead of searching for that, however, they should seek fifteen minutes of drawing. When fifteen minutes is all you’ve got, what the heck, go for it. That’s what I did today. I was at the National Gallery of Art. A glance at my watch told me I had about twenty minutes until my parking meter expired. That meant fifteen minutes to draw. So I took it, drawing a detail from Paul Cezanne’s Peppermint Bottle. 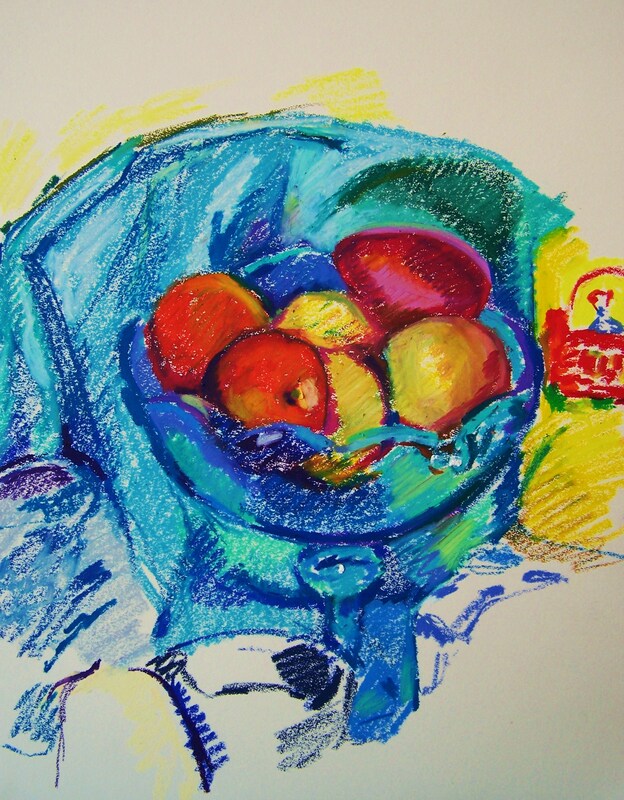 After I got home I drew my blue compotier with the same urgency I had used in front of Cezanne’s picture. It’s amazing how much you can extract from just fifteen minutes. Give me fifteen minutes of drawing over fame any day. I based this drawing on one from a “how to draw” book, changing it enough (I hope) that perhaps even the original artist would not recognize it. My aim was to get back into the habit of drawing faces, also to do them quickly, and to use whatever means are lying around. Perhaps I’ll get back into the habit of asking people to let me draw them — and overcome my shyness! perhaps we can create an “a-day” motivator for that too! — un-shy-thing-a-day that I did today — any takers? Any reticient types out there ready to join me? Was also thinking I might find a husband for Renoir’s sweet looking young woman. But neither of these will do. One’s too old, the other’s way too serious. When you’re busy raising hamsters, you’ve much less time for drawing fish. Alas. So, to while away the time not spent watching baby hamsters squirm, when I am not busy cooing — and saying “oh, look! how cute!” — I do this. Today’s copy after an old master is from Rubens’s famous painting of his second wife Helena. Yep. Left hand again. If I keep this up, I’ll be afraid to draw with my right hand again! Alas. Well, thinking about it got me in motion. I went digging around looking for a reproduction of the image so I could look at it. And I made the quick drawing above. Became quite captivated by the face — which is more ordered than the face of the Italian picture. Quite possibly the NGA version might be painted by another artist — I’m not saying it’s not. But it’s such a beautiful painting. Can’t it be enjoyed simply for what it is? For its own loveliness? My kid wanted a drawing lesson today so I suggested she do what the old masters did when they were pups: copy. Asked what she wanted to copy, she said she wanted to draw “an old renaissance picture with people in fancy clothes.” So I gave her a catalog from the Met, and she ended up choosing Ingres’s fabulous portrait of the Princesse de Broglie. She had some questions afterwards about aspects of her drawing so to answer them I made a super-fast “copy” of my own, the above. I’m glad I can teach my kid to draw because drawing becomes one more tool a person uses for thinking about things. Whether one becomes an artist or not is irrelevant. When you know how to draw, you see things in a new way. Moreover, drawing is a useful skill. You can design all manner of things once you know how to imitate the image you hold in your mind. Only once did a teacher show me something in art by making a drawing of it herself. That was my high school art teacher Karol Thompson. In college and ever after, every question one asked was answered with talk. I have the utmost respect for anyone who will answer a question by picking up the pencil and “telling” in lines and shades. My daughter’s question was very focused and my answer — my loopy answer — was equally quick and free. And that’s the way I like it. Regular readers of this blog know I like to make copies. I also like to have fun. A while back when I was drawing horses I made these two drawings which live on the same sheet thanks to the invention of construction tape (used to make a larger sheet by combining several sheets together). I was copying horses from Japanese art. Unfortunately I can’t remember who the artist is. Hiroshige, Hokusai, someone else? I dunno. But here they are. My copies are definite interpretations. Mine lack the rigor of the originals (boo woo) and also have a laisser-aller element that I attribute to the “fun” aspect. If one were turning Japanese masterworks into kid cartoons, you might get a drawing somewhat a kin to these. But, hey, sometimes an artist just wants to have fun. I was browsing through the exhibition catalog of the National Gallery of Art’s Jan Lievens show today. 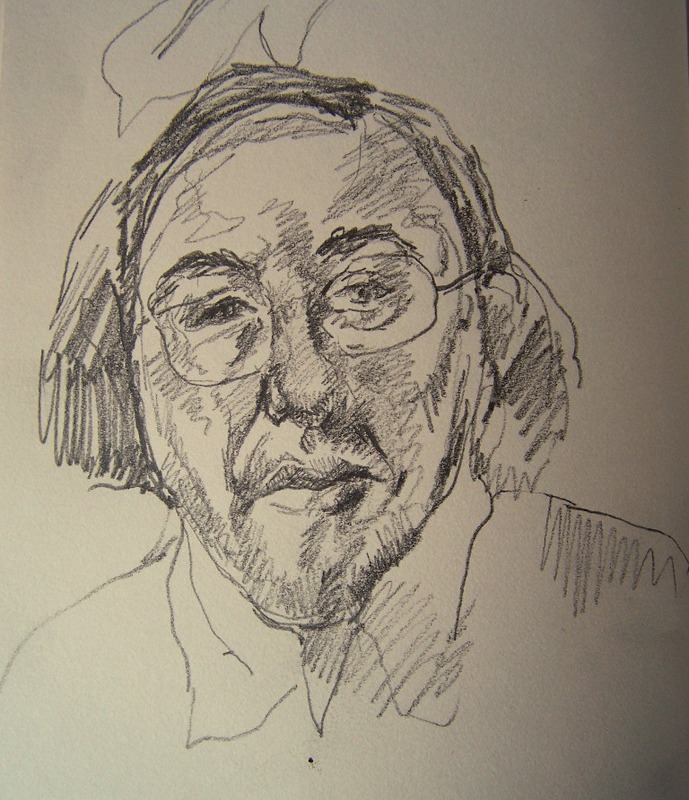 Made a quick drawing after the wonderful “tronie” Man with a Beret. I used colored pencils. How I’ve changed. I used to be such a snob. I didn’t think that colored pencils were a “serious” medium. Now I love them. I’ve grown. Nowadays my attitude is, “if you can draw with it, how wonderful.” I love drawing. Whatever you can capture ideas with is a “serious” medium. Get your own copy of Lievens here.